Keep Your Pants On Giveaway | A Savings WOW! 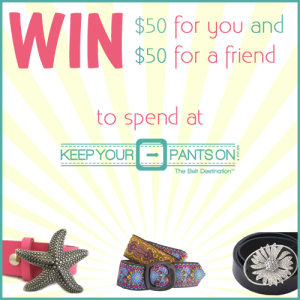 Grand Prize: A $50 Keep Your Pants On gift coupon for you and one to give to a friend! The giveaway will open up on 8/27 12:01 am EST and close on 8/30 at 11:59 pm EST. This is a great giveaway! I struggle with finding a good belt! Thanks for the chance.